Delays on the M1 northbound at junction 28 are likely to remain for most of the evening following a five-vehicle crash this morning (February 10). 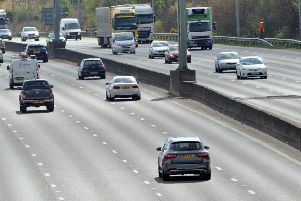 The incident happened just before midday and caused severe delays on the slip road exiting the motorway and connecting to the A38 at Tibshelf. Highways England has managed to clear the debris from the crash however it is now repairing damage to the traffic lights coming off the motorway. Motorists are advised to take an alternative route while one lane of the slip road remains closed. A spokesman for Highways England said: “All vehicles recovered but due to the extent of damage to the traffic lights we have to keep lane one closed to allow our team to fix it. “Significant disruption on the slip and onto the M1 itself. Please allow extra time or seek an alternative route. “The lane closure on exit slip from northbound M1 will remain in place as the contractors continue to repair the traffic lights.